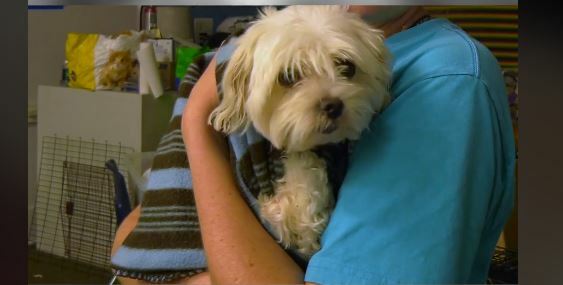 Tiny Maltese Soshe had been trapped alone in her house for more than a week. No food. No clean water. The sofa on which she floated wass all that was keeping her alive. The little dog was one of many victims awaiting rescue in the aftermath of Hurricane Florence, which ravaged residents of North Carolina. So many animals were stranded, in fact, that the local rescuers called in help. It was a team from the Humane Society of Missouri’s Disaster Response who wound up saving the day for little Soshe. In some places, floodwaters were at roof level and the team had to make multiple attempts to reach the home where a dog (Soshe) was stranded inside. On their third attempt, the boat broke down, but they didn’t give up, paddling more than a half-mile to the flood-addled neighborhood. After finally locating the right address, rescuers could see Soshe inside, floating on the couch, but as the water had caused the wood to swell and the water on both sides created pressure, they found it difficult to open the door. That didn’t stop them, either, though; they kicked it in and rescued the frightened and hungry little pup. Soshe was too scared to swim to them, and likely exhausted. She’d been alone without food for a week. Once safe in with her rescuers, she was cheery and otherwise okay, happily scarfing down her first meal since the hurricane. Later, a friend of her owner (who was stuck out of town when Hurricane Florence rolled into the area) showed at the temporary animal shelter to claim her. “She was distraught that she couldn’t get to her house and knew that Soshe was inside,” said the woman who picked up Soshe. She will reunite the dog with her owner. Soshe was one of several dogs, chickens and horses rescued by HSMO’s Disaster Response Team following Hurricane Florence. The nine-member team headed back to Missouri on Tuesday after a 10-day deployment. Anyone interested in helping pets affected by Hurricane Florence can call (314) 951-1542.